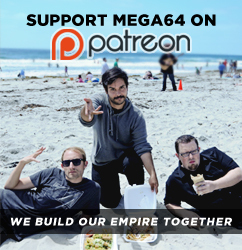 Mega64's new "Shadow of the Colossus" video released. Watch here or on Youtube in HD. Podcast #95 also released. We discuss the filming of the "Colossus" video, review Crank 2, and talk about Version 3 stuff. Watch below or subscribe to the left. Audio version here. Also, Penny Arcade used a funny picture of us today. This makes me want to start a band. I mean, we already look like Korn, there.